"Everything about this hotel was amazing." Have a question for Monarque Hotel Danang? "This hotel and the service amaze us!" "Great Hotel with Great Services, Staffs and Location." "Beautiful Breakfast and Tea Buffet." "All staff is kind(especailly Dory:)), Room was clean and nic..."
Situated in the Phuoc My area, Monarque Hotel Danang is the perfect place to experience Da Nang and its surroundings. The property is just 4 km away from the city center, and it normally takes about 15 minutes to reach the airport. With its convenient location, the property offers easy access to the city's must-see destinations. Monarque Hotel Danang offers many facilities to enrich your stay in Da Nang. While lodging at this wonderful property, guests can enjoy free Wi-Fi in all rooms, 24-hour room service, 24-hour security, daily housekeeping, taxi service. The ambiance of Monarque Hotel Danang is reflected in every guestroom. flat screen television, complimentary instant coffee, complimentary tea, free welcome drink, locker are just some of the facilities that can be found throughout the property. Throughout the day, you can enjoy the relaxing atmosphere of the sauna, outdoor pool, spa, massage, kids club. 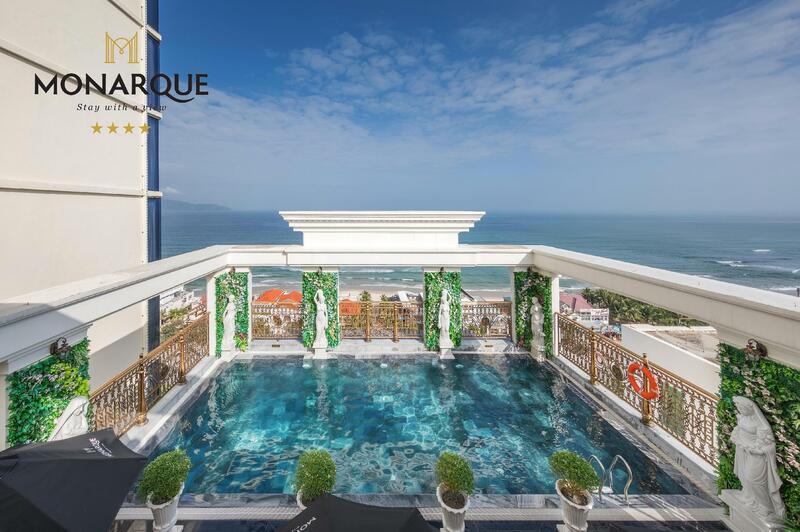 Monarque Hotel Danang is your one-stop destination for quality accommodation in Da Nang. "Another pleasant surprise was the free afternoon tea - which..."
Children 0-5 years old stay for free if using existing bedding. Maximum children allowed per room is 2. Any additional child will be charged an extra fee. The property offers complimentary afternoon tea from 03:00 PM to 05:00 PM for all guests. Children 6-11 years old will be charged VND 200,000 per child per night when using existing bed. Very impressed by the customer service. Staff were extremely friendly, proactively asking for feedback and providing recommendations for your itinerary. Complementary afternoon tea was beyond expectations, good variety and presentation. This is the best hotel i’ve been accommodating in recent ten years. Although it is not run by a big enterprise and only a four star hotel, it worth to get six star. The service is no.1. When i got off the taxi, staff immediately helped us to take the luggage to the hotel. I remembered that one day the sun shined fiercely. I again got off the taxi after shopping, the staff immediately used an umbrella to shelter from the sun for us. Moreover, one day when i had breakfast, i only talked to my friends that the sun shined very bright and I won’t sit here, a staff immediately pulled down the curtain without saying a word. They were really considerated! Basically, all staff in this hotel are excellent. Especially Mary and Clara, we are really grateful for their personalised care and professional advice during my stay in Da Nang. They asked us whether we had problems and chatted with us everyday. They are so nice, helpful and considerate. A lived in deluxe double and royal room respectively. This is a very big, clean, tidy and convenient hotel. Types of food in breakfast and tea time were delicious and everyday would have a little bit different. All the staff in this hotel are very polite, considerate, helpful and sweet. Especially Mary and Clara, both always provided us personalised care and professional advice which made our trip perfectly. Overall, this is the best hotel i’ve been living in recent years. It worth I grade it 6 star. I must choose this hotel again when I travel toDa Nang next time. The staff could not do enough for us in this hotel, one of the best on our trip. Recommend if you are anywhere near Da Nang. The staff at the hotel are very friendly and want to ensure you have everything’s you need. It is a very nice hotel in a great location. We had no problems whatsoever. It’s the staff that really make this hotel so nice. Great value for the price. Outstanding breakfast and enthusiastic staff. I can't find fault about this hotel. From the value of money, to the location, excellent staff service and very good food. I'm a traveller so I tend to compare the hotels that I stayed in every location and country that I've been and in whatever star 🌟 the hotel has but Monarque Hotel stands out of them all. I can't thank the hotel more than enough for the excellent service provided...you're the best. Should I recommend this hotel to my friends and to other fellow traveller? Absolutely! Everything about this hotel was amazing. The location was right across the road from the beach. The rooftop pool had great views and the bar/restaurant area on the roof served a wonderful afternoon tea each day. Breakfast was excellent. Rooms were clean and spacious, and the hotel staff went out of their way to make sure all guests felt welcome. We were treated to welcome drinks and given lots of valuable information about the area from staff. Some of the staff that made our stay very memorable were Gaga, Anna, and Clara. Highly recommend!!!!!!!!!!!!!!!!! We were glad to stay in the Monarque hotel in Da Nang as it turned out to be a hotel where you would like to come back to (what we certainly will do). The staff are very friendly, the rooms nice and the breakfast very enjoyable. If you want or need something all efforts are done to help you. Perfect. This hotel and the service amaze us! The beach is just opposite the hotel, very convenient. Nice and clean room, we can see the sunrise from our room. Variety of breakfast provided as well as complimentary hi-tea for the guests during our stay. The staffs are extremely friendly, helpful and polite- provide information to us not only when we approach them. Staffs are passionate and we feel warm and definitely will visit again. The best choice in my 2week travel in Vietnam. I recommend to anyone to travel to Danang. The city itself had not much to offer to us. But my family was so happy to stay all day in the hotel. The staff was super friendly and the best service mindset. They already checked what guest need and work proactively and made sure everybody is happy with their stay. Thank you again for all staff in Monarque hotel. Stay 4 nights in Monarque Hotel. Great Hotel with Great Services, Staffs and Location. Beautiful Breakfast and Tea Buffet. Lots of surprises when was stay. Wife got a beautiful bouquet of flowers for her birthday with a cake. Customer Relations Clara was great and thanks to her for making the stay memorable. Will return again. Every staff of this hotel is kind, friendly, helpful and nice. They gave us big smiles and friendly greetings everyday, especially Clara, who actively ask us for comments and opinions; and Roger, help us to take the luggage and open the car door once we arrived or left the hotel. I enjoy staying in this hotel and its facilities are perfect. I had a very very wonderful time with Mornaque when i was at DANANG. This hotel was placed in front of the beach, so we can easily get to the beach. So we can watch the sea in our room. and it was fantastic The room was excellently clean and all of the staff was very kind to us. Hotel swimming pool was also wonderful. After time, if i will visit DANAG again, i will resevate this hotel again. All hotel staff is very polite and friendly. When you check in, hotel staff will provide you the welcome drinks and snack. My room is big, clean, good lightning and comfortable, WiFi connection very strong and speedy. Opposite hotel is the My Khe Beach, about 150M walking distance, hotel nearby also have many seafood restaurants, 24 hours convenient store just about 6 min walk . Special thanks to Clara and Sofia, they are very beautiful, friendly, good communication skill and helpful, provide us many travel tips in Danang. The hotel is very lucky can have the good staffs like them. Hotel also provide free breakfast buffet and afternoon tea buffet, there have various choose and tasty. Overall experience for me to stay in this hotel is Fantastic! Recommend for those want to choose hotel with the good services quality, good location and affordable prices. Monarque Hotel was absolutely beautiful especially the Staff like Mary, Marylynn,Rose, Jane, katherin and to be honest if I knew or could remember all the names I would put all of them on here. They all were so friendly, helpful and always smiling. The room was great with a ocean view directly across the road. The weather did not do us any favors but the Staff and hotel facilities and food more than made up for any short falls from the rain. I love the staff and the Monarque Hotel and will never forget my beautiful experience here. Thank you all.